Curtis Brown, a proud middle-aged man, returns home from the grocery to store to find his son, Tyrone, polishing a gun. Tyrone hasn’t been home for over two years, and it is clear to Curtis that this is not a social visit. Many times in the past, Tyrone has sought protection from his father and Curtis has given it. Now it is different. When Curtis learns that Tyrone has killed a young clerk in a convenience store, Curtis orders Tyrone to leave. Tyrone begs his father for help, but Curtis refuses. Anger boils, culminating into a brutal struggle that leads to tragedy for both father and son. Based on a true story, the events that unfold cause us to examine the choices we make and the justice and judgments we live by. 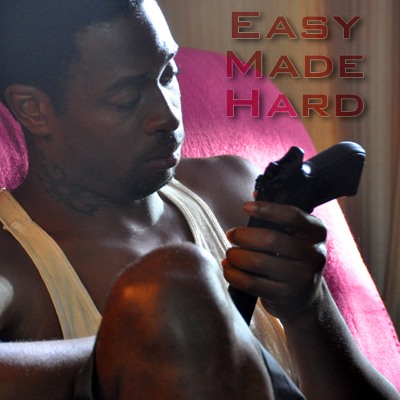 The response to Easy Made Hard is varied, but never neutral. This poignant story ignites passion and provokes us to take a close look our own families. It serves as a cautionary tale: Carefully monitor your choices. Do not become a Tyrone. Most of all, it forces us to look at our inner-city American culture. Discussion always point to lack of education, welfare mentality, and poverty of minds. Rarely are solutions found. We intend for Easy Made Hard to further the conversation. This is a story about Searcher, a woman who falls in love with a couch. ‏Searcher suffers from four failed marriages. She sublimates her desire for furniture instead of men. Steeped in a hallucination, Searcher communes with her dead mother who passes out warnings from the bathtub where she drinks wine and touches up her bloody wrists. ‏Disregarding her dead mother’s advice, Searcher continues her quest to satisfy her needs. In an antique shop she becomes desperately attracted to Couch, a handsome hunk with big bolsters and muscular arms. She brings him home. Once he (Couch) enters her world, she becomes so obsessed, he consumes her. ‏Moral of the story: Don’t bring home strangers. They can be dangerous!